From the Executive Director - The rapidly expanding shrimp aquaculture industry poses one of the gravest threat to the world's remaining mangroves. Over a million hectares of lush mangrove forests have been cleared to make room for the artificial shrimp ponds of this boom and bust industry. This highly volatile enterprise has grown exponentially over the last 25 years, leaving devastating ruin in its wake. The failure of national governments to adequately regulate the shrimp industry, and the headlong rush of multilateral lending agencies to fund aquaculture development without meeting their own stated ecological and social criteria, are other important pieces to this unfortunate puzzle. 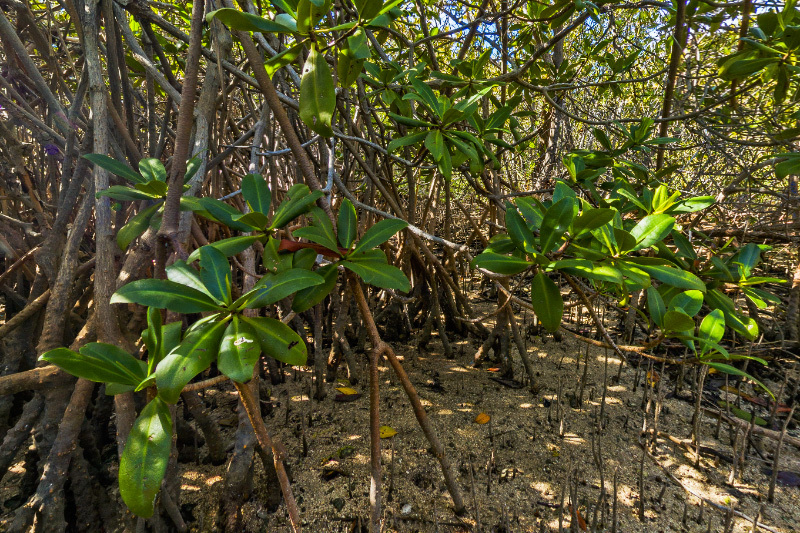 The fate of remaining mangrove forests may now rest in the hands of the consumers from the wealthy nations that import these luxury shrimp products. Since a highly profitable and expanding market is the driving force behind the shrimp industry, a worldwide reduction in consumer demand for pond-raised shrimp is called for. Meanwhile, stricter local governmental regulations and enforcement protecting mangroves are necessary. 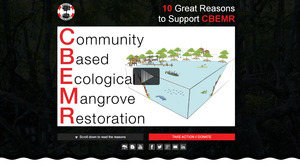 Also, involvement of local communities in sustainably managing and protecting their coastal resource base, including the nearby mangrove forests, is essential. As well, pressure must be brought to bear on the purveyors of shrimp in the US, the EU and Japan, where large retail stores and restaurant chains such as Costco, Walmart and Red Lobster continue to promote shrimp over-consumption in order to further their profits at the expense of both the environment and coastal communities dependent upon the mangrove forests. And now, the spotlight on this industry must also fall upon the slave trade and human rights abuses connected with the production process as evidenced by this recent expose by the Guardian News! BANGLADESH – National Committee to Protect Oil, Gas, Mineral Resources, Power and Ports has blasted the prime minister for what it said misleading the nation on the plans to set up coal fired Rampal Thermal Power Plant close to the Sunderbans. On June 5, 2014, MAP celebrated the World Environment Day. 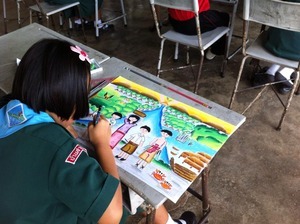 For the event, we organized an art contest at the Ban Sai Kuan School, gathering 26 students from 6 schools in the sub-district of Kao Mai Kaew, Trang province. Seven teachers from the six elementary schools and four people from the TAO (Sub-District Administrative Office) staff participated in the contest, including the TAO Chief Administrator, Mrs. Patcharin Thepkaew. 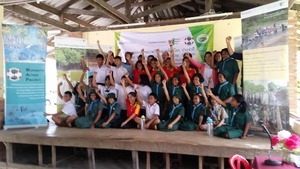 The contest started with a short ceremony with principal of the Ban Sai Kuan School, Mr. Jamrongsak Seesamai, giving a speech and then MAP presented certificates to the teachers for their participation and involvement in mangrove protection. The rules were simple: two hours to draw the mangrove and its entire ecosystem. Every student participated with enthusiasm and produced great drawings. After, the jury, composed of MAP staff, teachers and the TAO chief, viewed the art pieces and selected the three best drawings. The prizes were three kits for drawing with colored pencils and pens. More over, every participants and every teacher received a water bottle in order to reduce plastic waste caused by disposal drinking water bottle which pollute the environment where ever humans go. The morning finished with a shared lunch with teachers and TAO staff: an occasion to thank all the participants for their collaboration and involvement. Thanks to our mangrove projects supporter, the Global Nature Fund, and to the TAO Chief, Mr. Peerapan Rangmuang for his collaboration.